America voted in a Fire Monkey Year. President Trump was elected during the Year of the Fire Monkey. He was sworn in as President on 20 January 2017; still a Fire Monkey Year. BUT, his first term in office will take place in the Year of the Fire Rooster which began on 28 Jan. 2017. The Fire Rooster is Highly motivated and Authoritative ... but also can be temperamental & nervous. Fire Roosters are fiercely Independent, dynamic & probing. They will want to establish an infrastructure that relies on their own resources. Finally ... A President elected during a Fire Monkey Year, would do well (professionally) during a Fire Rooster First Term Year ... as money & contacts would be available for plans. Their home life will take a back seat ... exhaustion & being overextended in committments could occur. And, they must be careful not to underestimate their "opponents". A Year of The Competitive and The Crafty. The Innovative & The Imaginative. Risk-Taking Ventures, Willpower & The Drive For Success. NOTE: America declared its Independence in 1776. 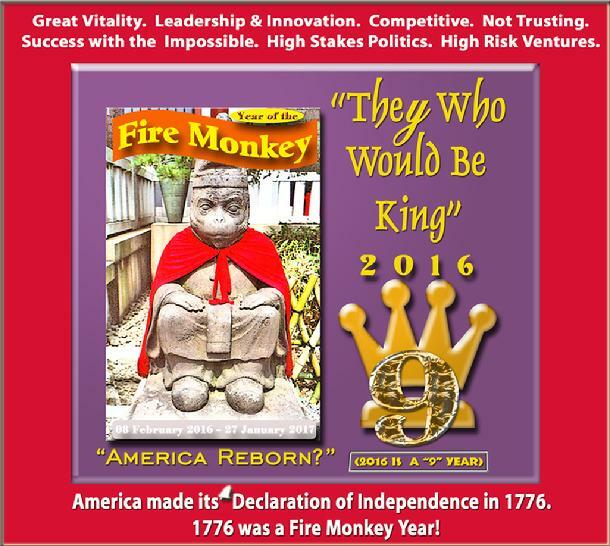 1776 was a Fire Monkey Year. So was 1896, 1956, and now .... 2016. Also in 1896: Utah was admitted to the Union - The Dow Jones Industrial Average was born - The Supreme Court upheld segregation with the "separate but equal" ruling - St. Louis, Missouri was decimated by the 3rd largest Tornado in U.S. history - Henry Ford produced his first "Ford" vehicle - The New York (Verizon) Telephone Company was founded. 1896: This was the period of the "Gay Nineties" and the rise of the "Progressive Era" of social activism. It also marked the demise of "The Gilded Age". A "9" year can indicate a year of 2 extremes. The Princes & The Paupers. The Flamboyant & The Lethargic. The desire to feel safe & accepted. Outgoing but not group oriented. Workaholics abound. Traditional minded. A Year of the "Lazy Genius" with "many irons in fire". Looking for the embodiment of one's Ideals. Wanting to embody one's Ideals. Kings & Princes ... Queens & Princesses ... but also: Passive ne'er-do-wells. People who embody a "flair for the spectacle, or the spectacular" do well during a "9" year. Moths will be looking for a Flame. NOTE: At first glance Donald Trump comes across as very "Fire Monkey" like: A born strategist, gets what he wants without too much effort, a risk-taker, and pursuer of "impossible ventures". Purveyor of sky-rocketing business success. A drive to be on top, a tendency to dominate, full of ideas .... opinionated, bold and argumentative. BUT; Donald Trump was born in a "Fire-DOG" year (1946) ... so he is not a Fire Monkey; but would seems to "fit right in" to a Fire Monkey Year. During a Monkey year: Trump experiences hectic activity, good news & home celebrations ... extra expenses, more traveling than usual and a possible "change of residence". New friends and important people offer support. The Fire Boar ... apart from having powerful & intense emotions has little in common with the Fire Monkey. But, The Fire Boar will follow its goals with fierce determination. During a Monkey Year: Hillary experiences a lack of money & support, various domestic & personal problems. Will be able to borrow money and get help from other people joining her efforts. The President is Eisenhower ... the Vice-President is Richard Nixon (future U.S. President) ... the senate Majority Leader is Lyndon Johnson (future U.S. President). A U.S. presidential election was held in 1956. Eisenhower is re-elected for a 2nd term. Videotape makes its debut in a demonstration in Chicago - The Dow Jones Industrial Average closes above 500 for the first time. America will vote in a Fire Monkey Year. BUT; the first term of the newly elected President will be in 2017 after he or she is sworn in. So: The First Term of the newly elected "Fire Monkey" President will be in the Year of the Fire Rooster which begins on 28 January 2017. The actual swearing in ceremony is supposed to take place on 20 Jan 2017. BUT; the Fire Monkey (sworn in on the 20th) will serve their First Term in Office during a Fire Rooster Year. THe Fire Rooster promotes the Highly motivated and authoritative ... but also the tempermental & nervous. Fire Roosters are fiercely Independent, dynamic & probing. They will want to establish an infrastrucrture that relies on their own resources. 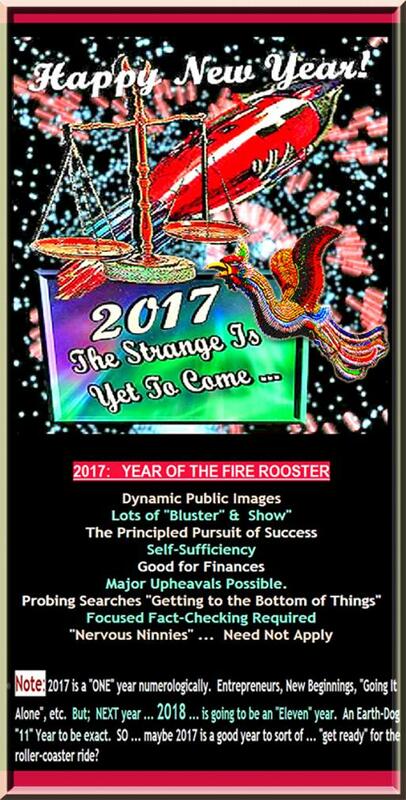 Neither the Fire Dog (Trump) nor the Fire Boar (Clinton) would find the Fire Rooster Year personally compatible. But; the Fire Boar (Clinton) would fare better personally. Finally ... An elected, during a Fire Monkey Year President, would do well (professionally) during a Fire Rooster First Term Year ... as money & contacts would be available for plans . The home life will take a back seat ... exhaustion & overextended in committments could occur and they must be careful to not underestimate their "opponents". Is this going to be a "Trojan Horse Year"?